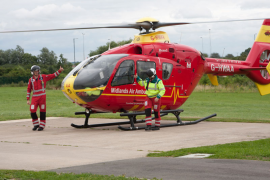 Midlands Air Ambulance receives no Government or National Lottery funding. Each Midlands Air Ambulance mission costs £2,500 and in excess of £9 million is needed each year to keep its three air ambulances operational, which is donated entirely by the public and local businesses, with four in ten of those we help funded by Gifts in Wills. Michelle McCraken, fundraiser for Midlands Air Ambiulance will be visiting the club to tell us more about the life saving work that the Air Ambulance carries out. Tom Cunliffe returns to Bromsgrove Boaters to give us more of his sailing experiences, wisdom, and humour. Tom started sailing back in 1961 when his Dad shoved him and a pal off on the Norfolk Broads in a 22-foot gaff sloop with no engine. That way you either learn fast or come to grief. He was fourteen and was lucky. Since those days he’s sailed most things – from Firefly dinghies at University to big gaff schooners. He’s been Mate on a coasting merchant ship and run yachts for gentlemen, operated charter boats, delivered all sorts of vessels, raced at quite high levels and taught sailing, becoming a Yachtmaster Examiner in 1978. With his wife Ros and he has sailed all over the Atlantic, from southern Brazil to Iceland and from the Caribbean to Russia, with a number of trips to the US and Canada thrown in. Tom is a writer (“The Complete Day Skipper”, “The Complete Ocean Skipper”, “Shell Channel Pilot” and many more), journalist (“Yachting Monthly” and others), broadcaster (“The Boats that Built Britain”, “Island Race” and more), and a keen motor-biker but, most of all he is – and always has been – a fanatical yachtsman.